PlayStation Move party game Lights, Camera, Party! is coming to the PS3 later this month, bringing with it 50 mini-games to enjoy. The game included everything you would expect from a party game – fast-paced, funny, quick, social and challenging. 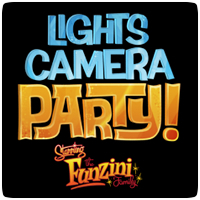 The primary story mode supports up to four players, guiding the Funzini family through five rounds of mini-games, each modelled after a type of TV show. Other modes support up to eight players and feature selections of Lights, Camera, Party!’s 50 mini-games in a variety of challenging formats.